Is your liner food safe? What does and doesn’t grow well in a wicking bed? Do I have to drain the water out, and if so how often? Do I need to line all the way to the top? What happens when the water level drops well below the soil? How does it get up through the stones? Q. Is your liner food safe? One objection many organic and permaculture types have when they first hear about the wicking bed concept concerns the idea not only of using so much plastic to line and plumb the beds, but the question of what toxins that plastic might be leaching into the soil, plants, and thus your mouth come dinner time. Many wicking bed builders use as a liner either builder’s plastic (polyethylene which is supposedly chemically inert so unlikely to leach but it is not hard if not impossible to get any statement about its suitability for lining wicking beds from any manufacturer!) 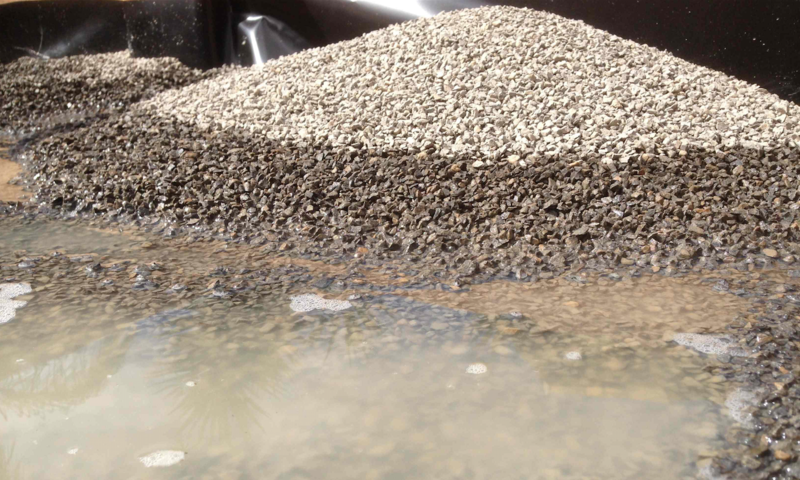 or synthetic rubber pond liner (which through very strong is even more of an unknown). We share this concern, and it has taken us a lot of experimentation and research to find a solution we are happy with. Our breakthrough was prompted when we were asked to install about 40 large wicking beds for a Melbourne-area council community garden. As the beds were being raised due to soil contamination issues, the council wanted written evidence that the liner used in the beds was 100% safe for use in vegetable gardens and potable/drinking water certified. 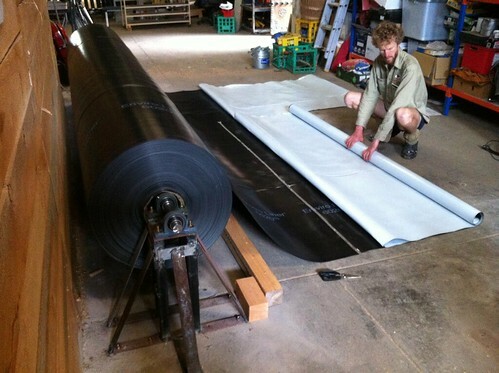 Thus our quest began, and after many days of solid research, we eventually found a solution – a liner that is not only certified potable-water grade and especially produced to line the likes of council drinking water reservoirs, but is tough and very hard to accidentally puncture when installing. Unfortunately, the smallest quantity you can buy this product in is 3.7m wide rolls that are 600m long and weigh over a ton! Fortunately, however, we have somehow wrestled one such roll into a dispenser contraption in our warehouse and are happy to share ;-). As regards the inlet & outlet pipes, by the way, PVC piping is not ideal. Poly pipe is much better from a toxicity perspective. This is why we use 25mm low-density poly pipe and fittings for both our wicking bed top-up pipe and our VEG-original three-way water level indicator/overflow/bed drainage tap. Q. What does and doesn’t grow well in a wicking bed? Firstly, wicking beds are best suited to veggies. They aren’t generally used for trees and other perennial plants although you might have a few strawberries and other shallow rooted perennials in there. Most veggies do better in wicking beds because of the low stress, constant moisture. Some root crops, like garlic might be prone to rot in these conditions however, and others like daikon radish might not develop to a full size due to the shallow (generally 35cm or less) soil layer. Q. Do I have to drain the water out, and if so, how often? Depending on how much fertiliser you use, and how often it rains, some nutrients will be washed into the water reservoir. This needs to be drained occasionally – we reckon once every twelve months is average. But it might be more if you’re overdoing the dynamic lifter. You can poke a twig (or finger) into the overflow pipe and give the water a little sniff. If it’s on the nose, it’s definitely time to drain! Q. Do I need to line all the way to the top? The crucial height to line to is at least the height of the overflow pipe. We aim for 10cm above this point on our installs, and typically supply liner with our kits so that you can line the inside of your bed to closer to 10cm from the top. This extra liner can increase the life span of your timber, and at the same time, gives you a little extra to play with when installing, so less can go wrong. Q. What happens when the water level drops well below the soil? How does it get up through the stones? In the VEG wicking system, when the water reservoir is full, the water touches the geo-textile, and creating a wet blanket, and is sucked up into the soil via capillary action. 3) still have enough room between the pieces for lots of water. To round it all out, the enclosed nature of the wicking reservoir, regardless of how much or how little water is retained, creates conditions for humidity and condensation to occur (especially in warm weather when the plants most need that moisture). We don’t know if this has been studied or not, but it does help explain why the plants in our wicking beds remain happy even as the water level drops below the extent to which the screenings may wick water up to the geotextile fabric. We think water, even from the lower reaches of the reservoir, condenses on the underside of the geotextile fabric, then wicks up the standard height (30-40cm) into soil. Hence the fact that the many beds we build in this way all work so well.